The pagoda is actually a temple which has its origin in Buddhist Asia and is a typical example of the architecture we find in China, Thailand and Japan. The pagoda consists of a slender tower with multiple floors where each floor has its own roof. The roof size becomes smaller reaching the top. Usually a Pagoda consists of a stack of 7 to 13 floors. The roof design of each pagoda is unique and on the upper roof we find a pole with many gold discs. The pagoda is of course very well known in Japanese architecture and gardens. Not only do we find amazing "life size" pagodas which are mostly built of wood and reach many tens of meters into the sky. Of course we also find the stone pagoda in almost every traditional Japanese garden. 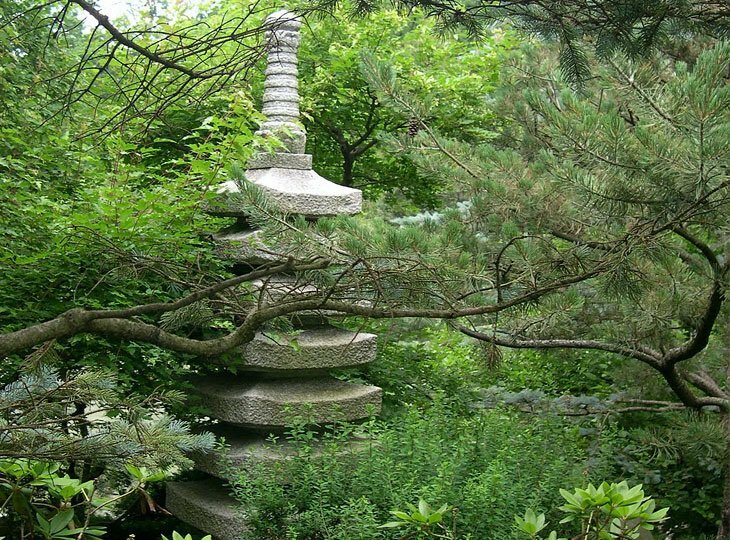 The pagoda is usually made of granite or basalt and has a religious function in addition to the role of decorative focal point in the garden. Usually we find the Japanese pagoda at the highest point in the garden or on the edge of the koi pond. A properly installed granite pagoda in the Japanese garden, covered with moss and bathing in the last rays of the autumn sun, becomes a real treat for the eyes and soul. Actually, a true traditional Japanese garden may not lack a pagoda. Please be advised Yokoso Japanese Gardens can also assist in the search for, purchase or lease of authentic antique Japanese pagodas and granite ornaments for you. Products that you won't be able to find on our website can, most likely, be ordered. Please use our contact form. Provide a clear description of the desired product and a reference to a picture on the internet and we will try to find the product for you.